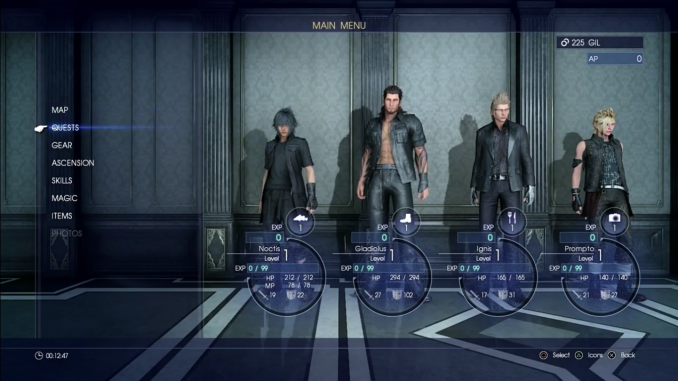 This page contains a directory on all character skill guides in Final Fantasy XV, namely Fishing (Noctis), Survival (Gladiolus), Cooking (Ignis) and Photography (Prompto). Each member of the party has access to a unique skill based on their favored discipline. Each skill has 10 levels of development. To level up, you’ll need to obtain Skill Points (SP). These are tallied once you rest up at camp or lodgings, or at the end of a chapter, much like EXP.